Our quad trailer range is suitable for loading and transporting sheep and other livestock amongst all its other uses. These quad trailers can load, dump and carry materials such as bales of hay, logs, fuel, feed and tools. The quad trailers can be used around the farm yard, stable and gardens and are perfect for towing with an ATV or UTV vehicle, varying in construction and size to suit the unique needs and requirements of our customers. The quad trailer range is made from polyethylene or galvanised for strength and durability. ​Used for smallholding tasks and made from strong commercial grade plastic, the polyethylene trailer will carry small livestock and horse manure without rusting the cart, whilst the galvanised quad trailer is best for dealing with non-corrosive loads. Some features of our ATV quad bike trailer range are the easy tipping mechanism, heavy duty construction, removable doors and additional tow bars. The mesh extensions and other extras such as the easy dumping mechanism makes our trailer selection perfect for different uses and terrains. These quad bike trailers are specially designed to be towed behind an ATV quad or UTV vehicle and have an easy tipping feature that makes them easy and practical to use around farm yards, stables and gardens. The 250 litres quad trailer is suitable for use in harsh terrains, has a heavy duty galvanised frame and is fitted with 2 pneumatic wheels for stability on various terrains. Capacity 250 litres. Dimensions: 1700 x 800 x 780 mm. ​This ATV quad bike trailer is fitted with an eyelet hitch (lever ball hitch fitted on request). Protective steel plate on front lip of trailer prevents damage on impact. Strong hinge point allows for easy tipping of loads making it suitable for use around the farm, yard, stable and garden. Tipping mechanism for minimum effort when dumping heavy, bulky loads, including sheep and livestock. 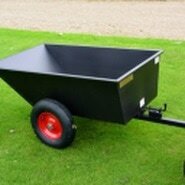 This quad trailer has a galvanised frame and polyethylene body for durability and stability. The ATV trailer is fitted with 2 roller bearing 4-ply pneumatic wheels. This 400 litres quad trailer is constructed from heavy duty galvanised material and fitted with 2 pneumatic wheels. Its innovative tipping mechanism ensures minimum effort is required when loading and dumping heavy, bulky loads. This quad bike trailer is easy to manoeuvre and its sturdy construction makes it suitable for use on harsh terrains. Capacity: 400 litres. Dimensions: 2200 x 1200 x 900 mm. ​Strong and durable polyethylene body mounted onto a galvanised metal frame. Protective steel plate on front lip of the ATV quad trailer prevents damage on impact. Galvanised frame and polyethylene body ensures a lasting life. These ATV trailers are ideal for farm yard, stable and garden uses. The 500 litres quad trailer is manufactured in the UK from strong polyethylene with a galvanised metal frame. This quad bike trailer is fitted with 2 pneumatic wheels and its strong construction makes it durable and weather resistant. These quad bike trailers are suitable for carrying and transporting heavy and bulky loads, and for general farm, stable and garden uses. The strong metal support frame makes this ATV trailer suitable for carrying loads up to 500 kg. Manufactured from heavy duty polyethylene body mounted onto a galvanised metal frame. Fitted with a lever ball hitch. Sturdy, durable and long lasting. The innovative tipping mechanism ensures minimum effort is required to transport and dump heavy and bulky loads. Strong hinge point allows for tipping of heavy loads. This quad trailer has fitted roller bearing, 4-ply pneumatic wheels. ​Strong polyethylene body. Galvanised steel frame. Lamb dividing gate optional. Removable back door. This quad trailer has galvanised steel ramps at the rear to ensure an easy loading of livestock such as sheep. Strong polyethylene body. Galvanised steel ramp at rear. Lamb dividing gate available. The Chapman ST150 quad trailer is robust, reliable, durable and practical. This quad trailer is manufactured in the UK for professional use and has been recently updated in its design with integrated features to make life easier for the user. The 5x3” (1m x 1.5m) quad bike trailer has been galvanised for lasting durability and the fully seam welded construction and aluminium chequer plate floor makes this ATV trailer a tough, heavy duty quad trailer for farm, equestrian, smallholder and estate uses. These quad trailers are competitively priced and full customer support is provided. Robust 2 mm folded steel sides with precision cut laser vents. The glued and riveted floor aluminium tread plate floor and rear door of this quad trailer reduces noise. This quad trailer has a ramp tailgate with integrated swing door. The draw bar can be rotated to accommodate different tow ball heights. The quad trailer is easy to tow thanks to its large, good quality 22x11x8" flotation tyres. The bolt on axles allow ease replacement or fitting of larger tyres or twin axles. Manufactured in the UK with tried and tested swivel hitch. High speed axles with sealed angular ball bearings. Weight 150 kg. Axle 5 mm. This Plastic Bodied Quad Bike Trailer is a great all-round trailer that can be towed by a quad bike, compact tractor, UTV vehicle or ride-on lawnmowers. Having the body moulded from a strong commercial grade plastic means that this quad bike trailer will stand the carting of corrosive materials such as horse manure, without causing the body rot. ​These quad trailers can be used on the smallholding to do many jobs, such as collecting wood and logs, shifting bales of hay and animal feed, carrying tools for fence repairs and a lot more. Its tipping mechanism makes it easy to empty. The two wide profile roller bearing pneumatic wheels, help to reduce wheel marks on soft surfaces. A manual handle is fitted as standard to assist in manoeuvring this trailer when used away from the towing ATV or other vehicle. 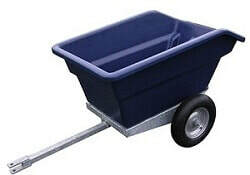 ​The trailer/barrow is styled on our popular plastic bodied trailer (PTP), with a strong moulded rot proof plastic body. The barrow handles are incorporated in the chassis, with an additional tow bar to allow the barrow to be towed when required by ride-on lawn tractors, compact tractors or quad bikes. 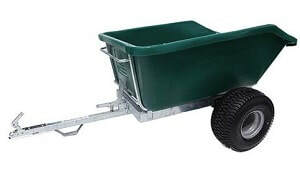 This trailer wheelbarrow is a popular choice for the equestrian and general smallholder and great for mucking out the stables or for poo picking in the horse paddocks, enabling the user to choose whether to use it as a muck barrow or a field trailer. This large capacity quad bike trailer has a rot proof skip and is ideal where a bulk transportation is required. The wide profile wheels, on four stud roller bearing hubs, fitted as standard, gives this quad trailer stability over rough or wet ground. The chassis of this quad trailer has been built from strong steel, giving the plastic body the necessary support. A metal buffer is fitted around the top roll of this ATV trailer. These quad bike trailers have a very simple to operate tipping device with an extendable tipping handle which makes the dump operation an easy task. The towing hitch is a 50 mm ball coupling which allows the quad trailer to be towed by an ATV, utility vehicle, compact tractor and some suitable lawn tractors. Other hitches are available upon request. This low cost budget ATV tipping trailer is ideal in situations where light to medium duties are required. 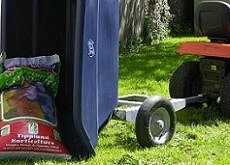 This garden and lawn quad trailer has full tipping facilities. A ball hitch is available for towing with a quad bike. ​A special feature of this metal bodied quad tipping trailer is its wide profile wheels, complete with bearings to prolong its life. The quad trailer has wide wheels which will keep "track marks" to a minimum. A manual push/pull handle is fitted onto the trailer to make it easy to manoeuvre when used away from the quad or compact tractor, so if your reversing skills aren't the best don't panic, simply use the manual handle and position by hand. Extension sides are available at extra cost. Tipping mechanism with positive spring bolt action. A special feature of this galvanised quad metal bodied tipping trailer is its wide profile wheels which come complete with bearings to prolong its life. This quad trailer with wide wheels will keep track marks to a minimum. ​A push/pull handle for using manually is fitted to make the quad trailer easy to manoeuvre when used away from the ATV quad or compact tractor. FGBHA Ball hitch - Standard 50 mm ball hitch instead of drop pin/clevis hitch system. FGGDTX Mesh extension sides - 300 mm (12") bolt on heavy duty mesh sides. The tipping mechanism has a positive spring bolt action. Extensions are available at extra cost. ​This large 500 kg (10cwt) quad trailer has wide wheels and a galvanised metal body to transport bulky loads of leaves, grass cuttings, logs, compost and other garden materials with ease. 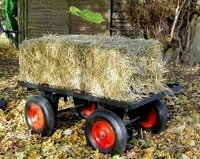 This ATV trailer is a good all-round quad trailer for garden, estate or smallholding uses. ​These quad bike trailers have a galvanised finish to ensure durability and a lasting life and can be towed with an ATV quad, compact tractor and other suitable vehicles. The tailgate of the trailer is removable to make emptying when tipped, simple. The quad trailer tipping mechanism with a positive spring bolt action aids an easy unloading of the materials. Weight: 84 kg. Wide wheels 16/650 x 8 pneumatic with bearings. These quad trailers are designed to be towed mainly behind a quad bike, but they can also be towed by a compact or a large garden lawn tractor. 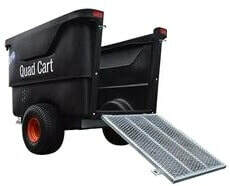 The quad trailer has a hinged tailgate for convenience. The mudguards run the entire length of this quad trailer to give extra carrying capacity for hay, straw bales or fence equipment. Main image shows the trailer fitted with the 900 mm (36") mesh sides. Wheel size: 22/10 x 8 (LGP) with bearings. FGGATVX18 - Mesh extension sides 18"
FGGATVX36 - Mesh extension sides 36"
This quad trailer is for off-road general purpose uses and suitable for towing with a quad bike, utility vehicle and compact tractor. The ATV quad trailer has wide wheels providing good flotation over fields and horse paddocks and is supplied with fixed high mesh sides making it perfect for carrying animals or bulky materials such as haylage, straw, leaves, grass cuttings and logs.